As part of the upcoming American Geophysical Union (AGU) Fall Meeting in San Francisco, LASP Director, Dan Baker, will serve as a panelist for a workshop on space weather. The workshop, “Getting Ready for Solar Max: Separating Space Weather Fact from Fiction,” will be held on Tuesday, December 6, at 10 a.m. PT. Baker will begin the presentation with an overview of our current understanding of the Sun-Earth system, including solar variability and its interaction with Earth’s magnetosphere. The number of solar flares and coronal mass ejections are becoming more frequent as the Sun moves toward solar maximum in 2013. There is a corresponding increase in public interest and media coverage of the effects of radiation and particles that impact the Earth, collectively known as space weather. 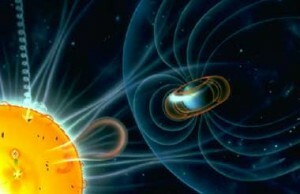 In addition to Baker’s introduction, the workshop will highlight the real threats space weather can bring—including particle radiation exposure for airplane travelers, GPS failure, disruption of satellite electronics, and power grid overload; and insights into the newest space weather observing and early-warning techniques.